"Is this the best Australian film in years?" The retail industry has provided rich atmospheres for film and television throughout the years from Clerks to Hi-Fidelity in cinemas to television’s Superstore and the legendary Are You Being Served? These fascinating atmospheres provide a mixture of personalities that open the door to exceptional storylines hidden within the store walls and then can even venture into the lives of all of the employees. Ladies in Black is based in the rapidly changing culture of Australia during the late 1950s, specifically within the work and experiences of the sales force in the iconic Sydney department store, Goodes. Seen through the eyes of Lisa Miles (Angourie Rice) who has taken a summer job during the Christmas rush, she is working amongst the ladies in black who work the sales floor of the bastion of fashion and style. While she waits for her final school exam results, the sixteen-year-old begins to find her place in the unique workplace and manages to prove her worth to the seasoned team of Fay Baines (Rachael Taylor) and Patty Williams (Alison McGirr) who specialize in cocktail dresses. The experienced duo shows Lisa the ropes and help her to make it in the fast-paced atmosphere of women’s fashion. 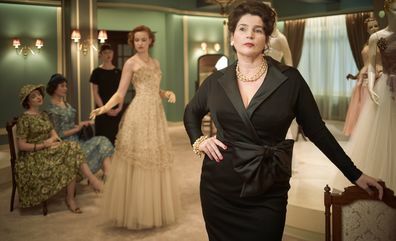 They become allies in this harsh atmosphere, but it is the teen’s connection with the elegant, immigrant manager of model gowns, Magda Szombatheli (Julie Ormond) who truly changes the life of this young student. As Lisa begins to prove herself to the women of the 5th floor, she begins to learn that even though her insular home life has provided so much, it is Magda and her husband, Stefan (Vincent Perez) that open her eyes to all the world has to offer. Through their Eastern European heritage they attempt to show the aspiring student the fascinating cultures of literature, fashion and food. The well-intentioned couple also prove to be effective matchmakers by connecting one of Magda’s co-workers, Fay Baines with their Hungarian friend Rudi (Ryan Corr). A chivalrous and industrious man who merely wants to capitalize on the opportunities of the Land Down Under. This romantic tale manages to combine the value of an immigrant heritage of the young nation with an historical look at the impact of the ever-changing face of the role of women in the workplace and still manages to show the importance of family in the lives of Australians. What two-time Academy Award® nominated film director Bruce Beresford (Driving Miss Daisy & Tender Mercies) has managed to do with this beautiful tale from his former classmate is unprecedented in Australian cinema. The Australian director has delivered a film from his homeland that is positive and uplifting while taking on timeless issues of immigration and social equality in an endearing manner that does not disparage the past, but shows the value of each generation. The beauty of Madeleine St John’s story is how it addresses the ever-changing social landscape of Australia while maintaining the respect of the previous generations. Despite the resistance that many may experience because of the impact of immigration and the roles of women had throughout history, this is a story that shows how patience and persistence pays off. This element was displayed in some well-timed, loving pressure that proved that people can adapt and change over time. To overlay the microcosm of the retail atmosphere as a magnifying glass to Australian culture provides a perfect depiction of how cultural change affects all involved, but how mankind can work better together than against one another in this inevitable process. The most significant distraction in watching this film was waiting for the typical revisionist history that typically occurs in modern cinema, but thankfully it did not happen. 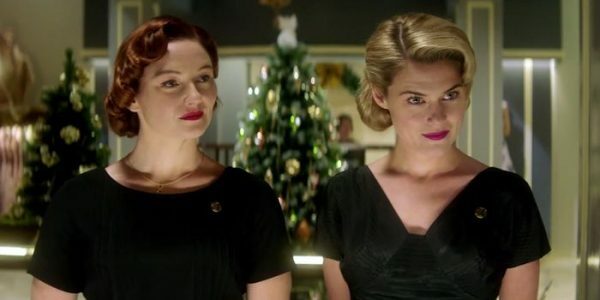 Ladies in Black was a pleasant surprise that should be a consideration for anyone who wants to celebrate the value of family, seeing the benefit of new cultural experiences and enjoying a film that should entertain multiple generations. This film is one of the best Australian films in years.